SOT Appreciates the Generous Contributions of the 2016 Annual Meeting Supporters. Supporters serve as visible evidence of an organization’s commitment to the Society’s mission of “creating a safer and healthier world by advancing the science of toxicology.” Moreover, your support provides an opportunity for private, public, and not-for-profit organizations to increase overall awareness of their services and programs to SOT members and Annual Meeting attendees. 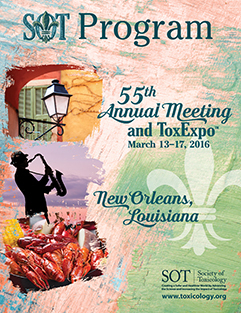 Supporters are listed in publications related to the Annual Meeting, including the Preliminary Program, final Program, pre- and postmeeting newsletters, and the ToxExpo Directory. In addition, Annual Meeting Supporters are listed on the SOT Annual Meeting website and mobile event app, essential sources of information for all registrants. During the Annual Meeting, visual acknowledgement, which group supporters by the level of giving, are prominently displayed, and Annual Meeting Supporter listings are included in the SOT presentations in all session rooms. In appreciation for their support of the Society, they are invited to the SOT President’s Reception. Your support helps SOT keep registration fees low thereby enabling the Society to attract over 7,300 anticipated attendees to the Annual Meeting. Your support also will help offset the cost of functions such as the: Minority Student Program, Undergraduate Program, Student/Postdoctoral Scholar events, Continuing Education Program, Public Outreach, and the Welcome Reception. If you are interested in SOT Annual Meeting Supporter Opportunities, contact Laura Helm SOT Headquarters at 703.438.3115 ext. 1403. All cancellations must be submitted to SOT in writing. A cancellation received prior to June 1, 2015 will receive a full refund, less a $100 administrative fee. A cancellation received between June 1, 2015 and December 1, 2015 will receive a 50% refund. After December 1, 2015, no refunds will be granted.